"26 years in business. 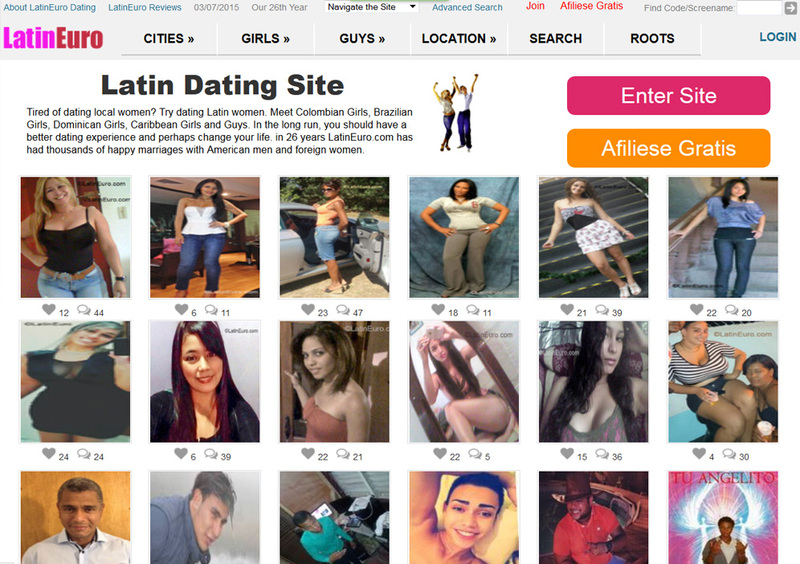 LatinEuro is one of the world's most famous Dating Sites/Social Network." 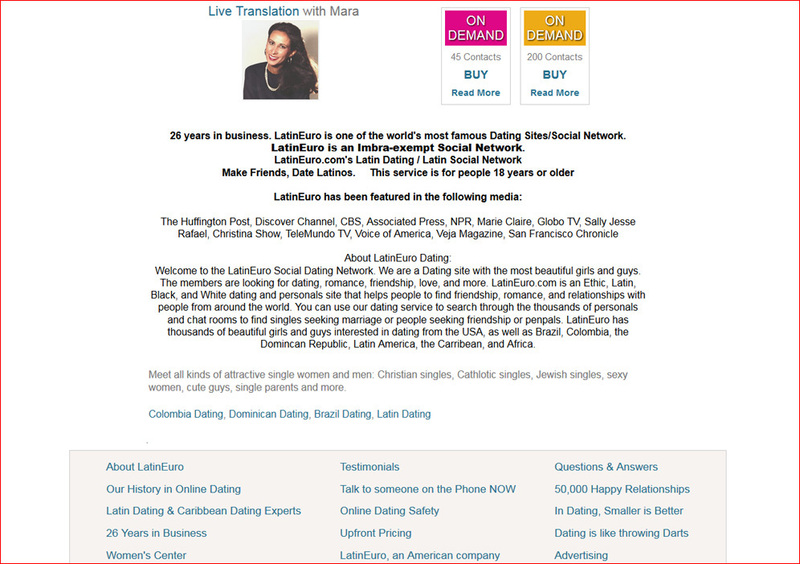 Over 25 years in business, LatinEuro.com is an online Latin dating website catering to singles. Men who are in search of a Latin girlfriend visit the site. Operating out of Miami Florida, Latin Euro has a slow website speed. Many visitors come from the United States and France while others visit from countries like: Dominican Republic and Spain. There are visitors who have attended graduate school and college on the site. There is no disputing that many of the women on the site are beautiful, curvy, and tanned and the men are young and handsome as well and not all are Latin. Blacks, whites, Africans and Caribbean's are also on the website as well as older gentlemen and older women who look young. If English is not one's native language, there is live translation available. People on the site look to: date, network, or make friends. Immediately you can view attractive looking women freely without registering like other dating websites. Check out the Girls or Guys tabs at the top of the screen and you can select for guys seeking girls all 10s, hottest, newest, body type, etc. For girls wanting to meet guys, you can view by hottest, newest, rich, etc. There is also a special section "Return to Your Roots" and has categories of people you might want to connect with based on your roots. Those groups are: Africa, Brazil, and Latin America as well as a large window to help you learn more about your ancestry provided by the popular genealogy site, Ancestry.com. One visitor turned member said that Latin Euro has by far better looking women than other dating websites and has had great success meeting these women with the help of the staff. Now if you see a member you like, you just click the "add" button and it will take you to the Latin Euro member's profile page. There you can read about her, check out how to get in contact with her, and then add her to a cart like you are shopping at an online store. You then view your cart, check out, and pay using your credit, debit or Paypal account. If you should want "OnDemand" an option featured on the site, this will allow you to pay for so many contacts all at once, rather than just pay for the one you just viewed. See site for current pricing. Once you pay, you can call members on the phone. Latin Euro doesn't offer tours. A current Latin Euro member is pleased with the site. He said he is talking to five young ladies and they are all "sweeties." One member was concerned that he would be meeting prositutues, but it turns out that all the women he has contacted are what he describes, "The real deal." Performing a specific search is easy, you can access it at the top of the page or on the same page where you browsed. You input your gender and preferences such as: age, height, hair color, eye color, body type, and check the box if you prefer the person to speak English. You choose a country (which there is a drop-down box that has choices from all around the world), indicate a city and then press the green "go" button. If you have any questions or concerns, this website isn't discreet about its contact information like others. You can email or telephone the company by scrolling below on the search page. If safety is a concern, the website offers many resources on their site. You can learn more about Latin Euro by scrolling around the site without ever signing up. The site has been featured on many major news outlets including CBS, Telemundo and the Associated Press. There were former members that didn't have a good experience after contacting some of the women. These men claimed that their contacts acted as if they were unaware of Latin Euro and that the site's customer service was not helpful. Also, they purchased an option to have letters sent and that the service was a waste of money. Like with all dating websites, think before you spend your money. But if you strongly desire connecting with a Latin woman, it might be worth a shot, because there have been more positives around the web about the site than negatives from users.